Dutch photographer Bas Princen was schooled in design, not in photography. Perhaps that is why he looks at the surrounding landscape, of Holland in particular, differently. Artificial Arcadia, his 40-photo-thick debut novel, deals with that landscape and its use. In a world in which the leisure industry can strike, or has struck, anywhere and anytime, it’s a miracle that people can still discover non-programmed adventure. What’s more, people are capable of rediscovering their own habitat time and time again. By choosing other forms of use, people alone can turn an unnatural area into nature or wilderness. We learn that from the gleaming photo of the green buffer bordering a golf course where two backpackers practice for a trip to Scotland – the very opposite of a Six Flags day, in terms of legality too. Of course the best thing is to find a piece of the Netherlands where you can do something that’s actually prohibited; only then is the adventure complete. In that sense, the creatures that populate Princen’s pictures are modern heroes. Whereas channelled leisure usually feeds in parasitic fashion – the Eiffel Tower is misused to promote Disneyland Paris for free – Princen’s playful people are dissidents within the realm of physical planning that, says essayist Lars Lerup, is ‘pseudo-fascist’. Nevertheless, Princen’s photos contain an element of tragedy, a second layer that instantaneously instils a sense of unease in the viewer. True, we see people with fantasy. But used for a very specific purpose, space becomes less public. In his essay ‘Leisure kills (public space)’ Wim Cuyvers goes a step further by writing on where else but the very last page of the book that the photos do not propose alternative uses for landscape but signal the end of public space itself. One is a logical consequence of the other. Seen in this way, we are here witnessing a new variation on the land grab. But this conclusion too is revealed earlier in the book in the diptych Sand Dump. After all, a war-playing clay-pigeon club leaves little to the imagination. No words are needed if you can speak like this with a camera. Bas Princen not only beats us to it time and again; he also leaves us speechless, without the strength to continue playing. 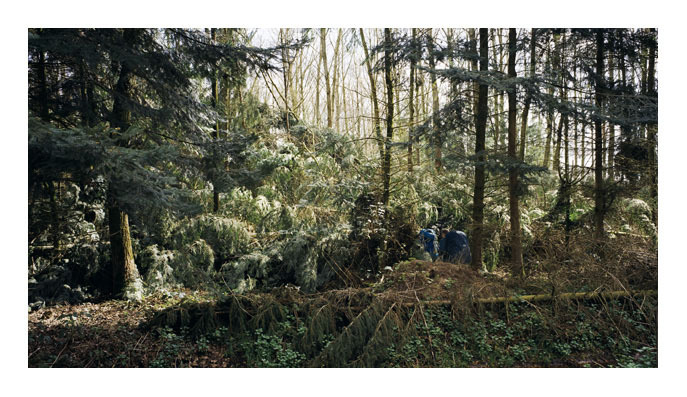 To explore and comment on Dutch landscape in transformation, Princen sets up his large-format camera before any intended user has even entered the frame, or has even been selected. And then there really is something worth seeing: uses other than those planned are – luckily – still possible in the fully pre-programmed Netherlands. Complementing the photos are five essays, each of which is prefaced by a question or statement from Princen. The formula works perfectly and, challenged by Princen, all contributors really do have something worth saying. But it’s the photos by Princen that make this book a must. His pictures speak a language that makes words superfluous. The first-year lesson in art history goes something like this: art is the communication through language of an emotion or message that can be felt or understood by the viewer, preferably with the intensity that the artist had in mind. Bas Princen’s chosen language is photography, a fact we should be glad of. Every picture hits the mark. We see big landscapes like those Ruysdael once painted with uncommonly evocative power. After all, the big scale in the Netherlands is the sky, the water, the polder landscape. In it we see people, small and insignificant as ants, engaged nonetheless in some activity. Sometimes, whether due to the mist or simply the distance, the creatures almost vanish, busy giving one final fragment of meaning to their existence before the ultimate fade-out. Yet this book is anything but a warning about mortality. In fact, Princen offers us hope. He shows us that public space is ideally suited, albeit often unintentionally, for human activity. Cycling on a refuse belt, abseiling from the Euromast – an effect of alienation is created by keeping the mast outside the frame – a game of casting fishing lines on land: all is possible. And it’s always the fantasy of homo ludens that gives a surprising twist to how land is used. Bas Princen, Artificial Arcadia, 010 Publishers Rotterdam 2004, p. 128, English, ISBN 90 6450 511 X, € 34.50. With essays by Wim Cuyvers, Jeff Derksen, Lars Lerup, Bart Lootsma and Dirk Sijmons. and from October 16 on at ArchiLab Orléans in the exhibition The Naked City.